Having recently secured several prestigious awards and accolades, The Westin Resort Nusa Dua, Bali continues on a winning streak to remain at the very top of its game for 2018. Right after the success of this year’s IMF-World Bank Annual Meeting, the resort was recognized in the Smart Travel Asia 2018 Best Travel Poll. In a survey conducted by this independent online magazine, the resort was ranked #9 in the “Best Conference Hotel” in Asia category. Similarly, we were acknowledged by ATOR (Association Tour Operators of Russia) with an award identifying us as one of the Top 10 Hotels for the Best Holiday Destination in Bali during winter. Winners were selected by a team of travel experts. 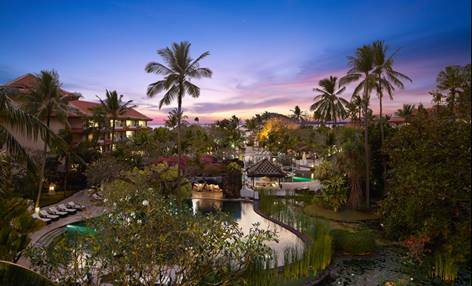 For the third consecutive year, The Westin Resort Nusa Dua, Bali has maintained its lead position as Top 10 Best Family Resorts in Indonesia from Australia’s leading online and print magazine ‘Holidays with Kids’. This annual initiative is driven by a detailed survey that asks readers to evaluate family-friendly hotels based on real experiences. It explores aspects such as location, facilities, hospitality and overall value for money. In the 2018 World Luxury Spa Awards, Heavenly Spa by Westin proudly came away with double honors. Our dedicated wellness facility was voted Luxury Romantic Destination Spa – Global Winner and was also honored to receive ‘Luxury Wellness Spa – Regional Winner’ to our growing list of accolades. Last but not least, Prego at The Westin Resort Nusa Dua, Bali was triumphant in the 2018 World Luxury Restaurant Awards. Discerning voters placed our dynamic Italian eatery as a Global Winner in the Luxury Family Restaurant category. “All of these awards reinforce the fact that we are have well and truly satisfied the needs of both business and leisure travelers. Our secured beachfront location, comprehensive meeting facilities and innovative approach to personal wellness are just some of the attributes that define us as an award-winning property,” commented Mr. Oriol Montal, General Manager of The Westin Resort Nusa Dua, Bali.